Whenever one of my kids gets sick, this is one of their top picks. I have to admit that I love it when I’m sick, too! It’s great because you can throw all of the ingredients in the slow cooker for the day and it basically cooks itself! The last thing you want to do when you’re sick is have to spend a lot of time in the kitchen, so this is the perfect comfort food! 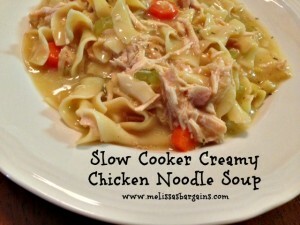 An easy, creamy slow cooker chicken noodle soup recipe! Place the frozen chicken breasts on the bottom of your slow cooker. Add the cream of chicken soup, chicken broth, and seasonings. About 30 minutes before you’re ready to eat, shred the chicken. You can either cook the noodles separately and then drain and add them to the slow cooker or you can add them to the slow cooker and cook everything on high for 20-30 minutes. I’ve had a few different recipes for cube steak pinned on Pinterest for awhile and I’ve been wanting to try them. It brings back memories of a recipe that my mom used to make when I was a kid using mushroom gravy and hamburger patties. 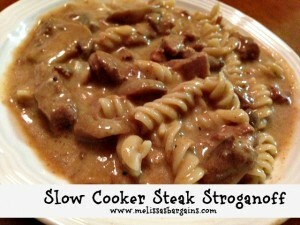 This recipe was a hit with my kids and with my husband, but I will say that the meat did dry out some after being in the slow cooker for so long (about 12 hours), so this is a recipe that I would say shouldn’t be left for more than 6-8 hours. 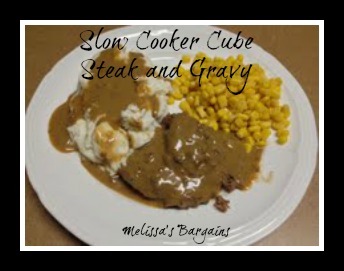 A super easy recipe for cube steak that you can make in your slow cooker! Place cube steak in the bottom of a greased slow cooker. Mix mushroom soup, beef stew mix, mushrooms and milk together and pour over the steak in the slow cooker. Cook on low for 6-8 hours. You’ll have a nice gravy for your meat and your mashed potatoes! I first discovered baked potato soup when I was in college and one of my roommates made it for us. I figured out a way to adapt her recipe so that I could make it in the slow cooker, and Slow Cooker Baked Potato Soup used to be a regular part of our menu rotation. I realized as I was meal planning last month that it had been quite awhile since we had eaten it. It’s easy to make an budget friendly, so I decided it was time to have it again! 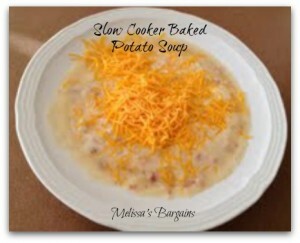 Super easy and filling baked potato soup that’s perfect for the fall and winter months! Grease slow cooker. Place diced potatoes on bottom. Cube the cream cheese and place the pieces on top of the potatoes. Sprinkle garlic powder, onion powder, pepper, and the bacon over the top of the potatos. Add the cream of chicken soup and chicken broth and stir everything to mix it. 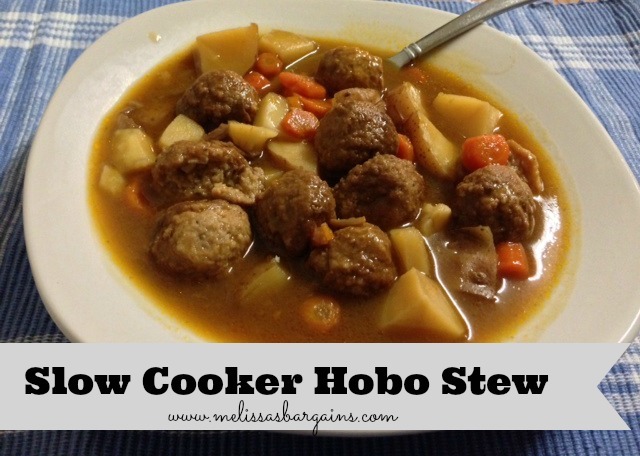 Cook for 7-8 hours in crock pot on low. Before serving, I take a potato masher and mash the potatoes somewhat. We serve with a spoonful of sour cream and shredded cheese!